Maddie Fortunado, heir apparent to her father’s real estate business, is stunned to learn that she’ll have to fight for the job she’d assumed was hers! Even worse? Her rival is none other than Zach McCarter, her secret crush. Only a makeover can transform “Maddie” into “Madeleine,” who can compete against her charismatic coworker. But when Zach meets Maddie 2.0, business is suddenly the last thing on either of their minds! 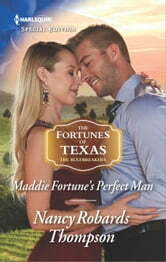 Maddie Fortune’s Perfect Man Nancy Robards Thompson Love reading about the Fortunes of Texas and Maddie and Zach’s story is one of the best. Both attracted to each other, both in competition for the same job, both fighting to fulfill their dreams, but can all of this enable them to find happy endings or will is not to be? Nancy has once again given us an enjoyable read with characters who draw you into their lives and have you cheering them on through all their ups and downs. Zac is definitely one of my favorites in this series.